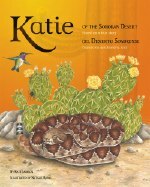 This is the true story of Katie, a meter-long western diamondback rattlesnake, and her adventures as she struggles to make a life for herself in the harsh Sonoran Desert. We're with Katie, sharing in her determination as she hunts for the food she needs to stay alive, her terror when attacked by vicious predators, and her care and devotion to the litter of babies she gives birth to. Although the story is told from Katie's point of view, the reason we know so much about her life is because of the work of scientists, who also appear in the story, using the latest technology to learn more about the private lives of snakes, and ultimately facing a terrible decision when Katie's life is in danger. This is the perfect read for any child who wonders what it might be like to be a rattlesnake, as well as for older children who want to know more about what it's like to be a biologist and what the science of studying reptiles and amphibians (herpetology) is all about. Winner of the 2010 IPPY (Independent Publisher Book Awards) Silver Medal for multicultural non-fiction children's books. Kate Jackson, Ph.D., teaches zoology and herpetology at Whitman College in Washington. She is also the author of the popular adult book Mean and Lowly Things: Snakes, Science, and Survival in the Congo, published by Harvard University Press. Natalie Rowe is a designer, illustrator, fiber artist, and occasional musician. She has been drawing furred, feathered, and scaled creatures since she could first pick up a pencil.